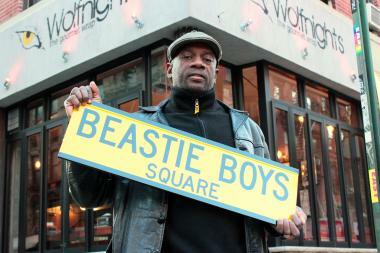 LeRoy McCarthy, who is proposing a Lower East Street corner be renamed after hip-hop group the Beastie Boys, has already gotten a street sign made. LOWER EAST SIDE — A proposal to name a Lower East Side street corner in honor of hip-hop group the Beastie Boys was rejected by Community Board 3 Tuesday night — and the board has barred LeRoy McCarthy from reapplying for the street naming for the next five years. McCarthy, a Brooklyn resident who first suggested the Beastie Boys honor late last year, agreed at CB3's transportation committee meeting on Jan. 14 to temporarily withdraw his application and return to the board with more signatures in February. However, CB3's full board voted overwhelmingly Tuesday night to deny the proposal to name the corner of Ludlow and Rivington streets Beastie Boys Square, which triggered a CB3 rule that an applicant cannot return with a similar proposal for five years, board officials said. The board voted 24 to 1 with 1 abstention to reject the Beastie Boys Square application. McCarthy did not attend the meeting because he had told the board that he had withdrawn his application and he did not expect it to go to a vote. "I was blindsided," said McCarthy, 46, who added that he has already received more than 200 signatures of support for the co-naming since Jan. 14. "Once again I was blindsided and not given the opportunity to present the full material they [CB3] requested." Adding to his confusion, McCarthy said he had received an email from CB3 last week confirming that the Beastie Boys Square proposal would be on the transportation committee's agenda for February. "They did not given me a chance to be heard at the committee, which was the arrangement that had been made," he said. Gigi Li, the chairwoman of CB3, said the full board decided to vote on the proposal because so many members felt strongly that the application could never meet CB3's requirements for a co-naming. She also said that despite the committee's resolution from Jan. 14 clearly stating a withdrawal of the application, a better word to describe its state was "pending," which paved the way for a full board vote. "My decision was based on the fact that it did not meet the criteria and the fact that previously our most recent group of co-namings held each application to the high standard of meeting every single criteria we set out for co-namings," said Li, who voted to deny the application. CB3's requirements include an honoree being deceased — in this case, Beastie Boys member Adam 'MCA' Yauch died of cancer in 2012 — and 15 years of service to the Community Board 3 area. The Ludlow and Rivington street corner has been a destination for Beastie Boys fans since it appeared on the band's 1989 cover for "Paul's Boutique." McCarthy, a film and television scout, is on a mission to honor hip-hop's New York roots and global influence by co-naming a street in every borough. Last year, his proposal to name a street after rapper Biggie Smalls in Clinton Hill was also rejected by the local community board. Li said the five-year ban on resubmission would apply to the Beastie Boys application, but it was unclear how specific the ban would be. In an email to McCarthy, CB3's district manager Susan Stetzer explain that part of the board's reason for voting Tuesday night was the concern "that you not put in many hours of work and then have the board deny in February," she wrote. Chad Marlow, the only board member to vote against the denial, said despite the board's strong feelings that Beastie Boys Square was not appropriate, McCarthy should have been given what he was promised. "The wise thing and fair thing to have been done would be to let him return to the committee," Marlow said. "This isn't about the Beastie Boys," he added. "It is about showing respect for the community."